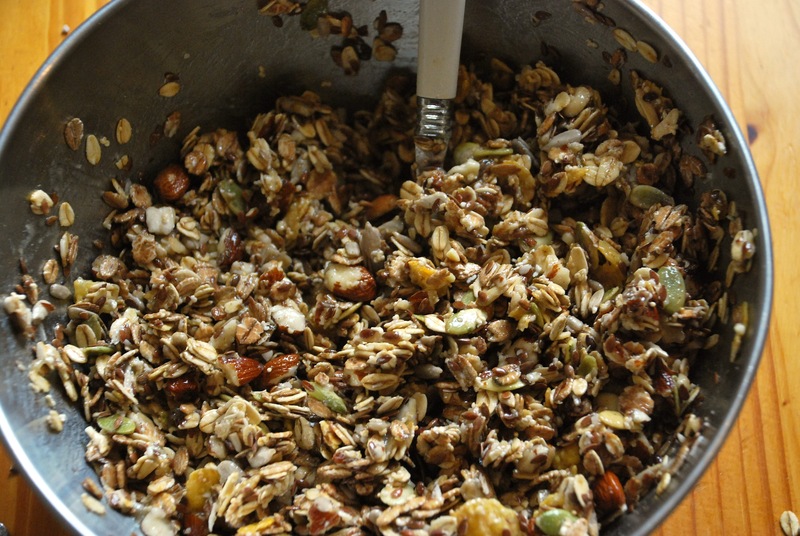 Crunchy Banana Almond Granola | vegänsch. Holy Granola! 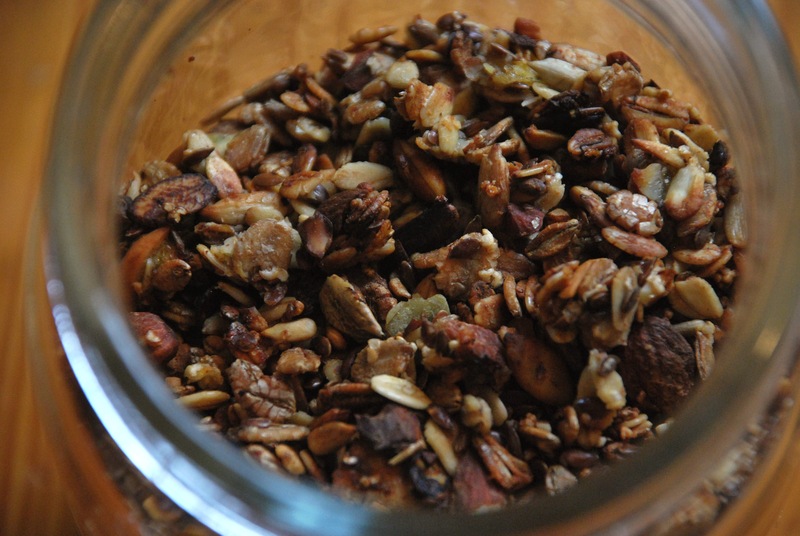 After spending two weeks in the States this year, I’ve asked myself: How can Germans live without Granola? We do have our “Knuspermüsli”, but this definitely doesn’t keep up with the awesomeness of a good Granola and the choice you have in the U.S. 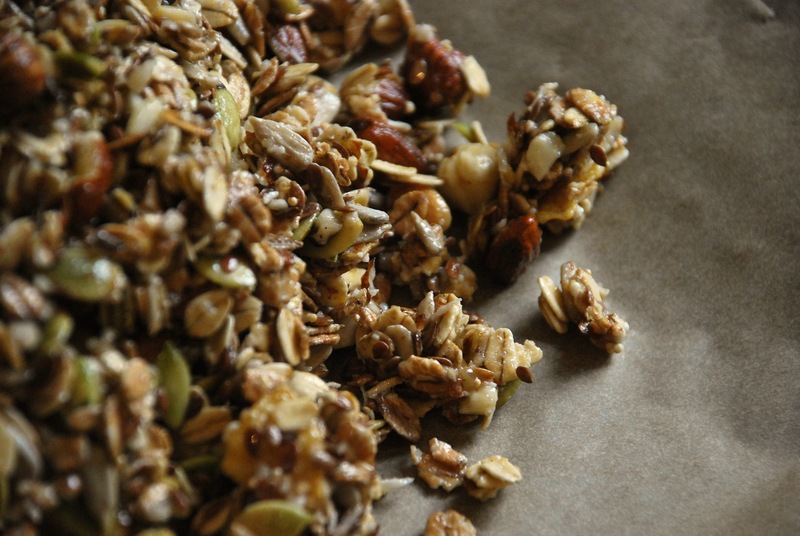 Unfortunately, most of the granola or Knuspermüsli you can buy at the supermarket is filled with refined sugars or syrups, non-vegan ingredients like honey and lactose, or just a rip-off with too few quality nuts. 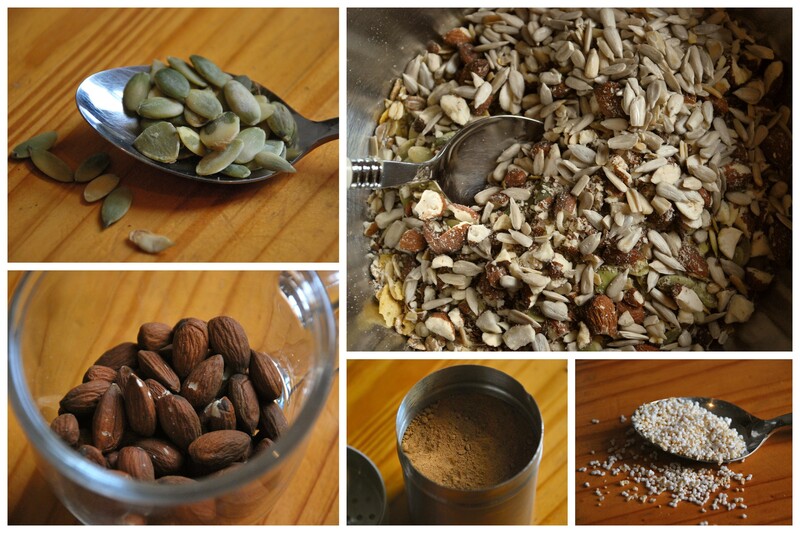 This calls for a home-made Granola recipe, just as crunchy and delicious as it should be, but vegan and healthy. The following recipe is for one batch (= one baking tray) of about 500g. 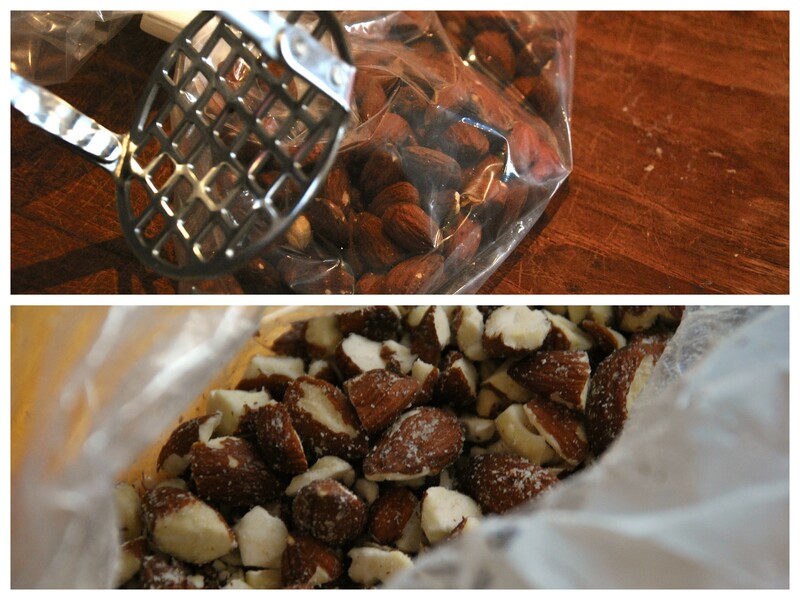 *I prefer my almonds a bit chopped up, so I put them in a plastic bag and use a masher (or hammer) to crush them a bit. Now preheat the oven to 150° C/300 F.
Make sure you mash the banana properly and mix it well with the oil and agave – better use a fork for this! Then stir well until the liquid turns into a smooth pulp. Spread evenly on a baking tray and bake for about 25 to 30 min, depending on your oven. Check every 5 to 10 min and turn over with a spoon or spatula at least twice so the upper side doesn’t burn. When it’s reached golden perfection, take out and let cool completely before placing into a container. This is the most important step – the cooling makes for a crunchier result. Enjoy with some soy-milk and cocoa, fruit or berries – or as a topping for this. /Thanks for reading! If you like my stuff (or have suggestions ; )), feel free to like, share and/or leave a comment. You can also find me on Facebook. Every comment welcome! Anne, we love your blog!!! These food really inspire our meals. Thank you! Keep it up! L<3VE from Melbourne. Oh, thanks so much! Wonderful to hear you’ve already tried it. Hm, agave nectar can be substituted by any kind of syrup, like sugar beet molasses (not that healthy, but still better than refined sugar ;)), rice syrup, coco flower syrup or birch sugar (called Xylithol). You should be able to get this at health food stores or organic supermarkets, I think. 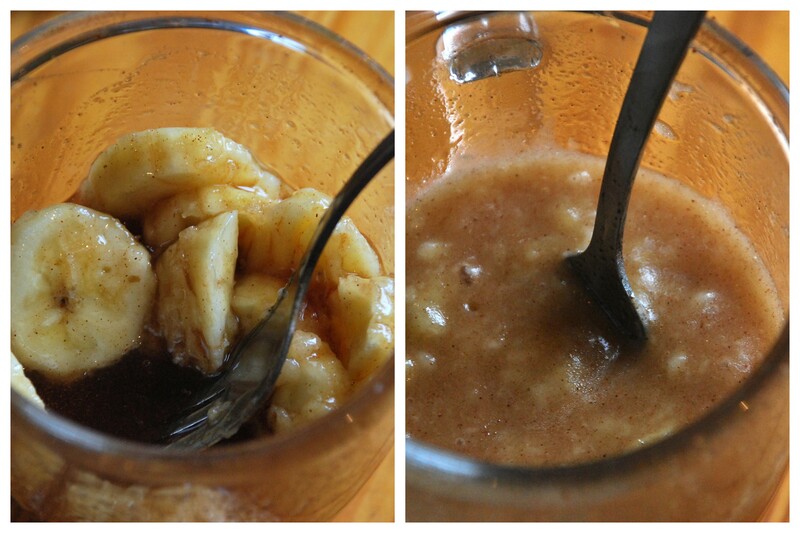 You can also puree dried or soft dried dates and make a syrup out of it, which is probably the healthiest option. Hope this helps! 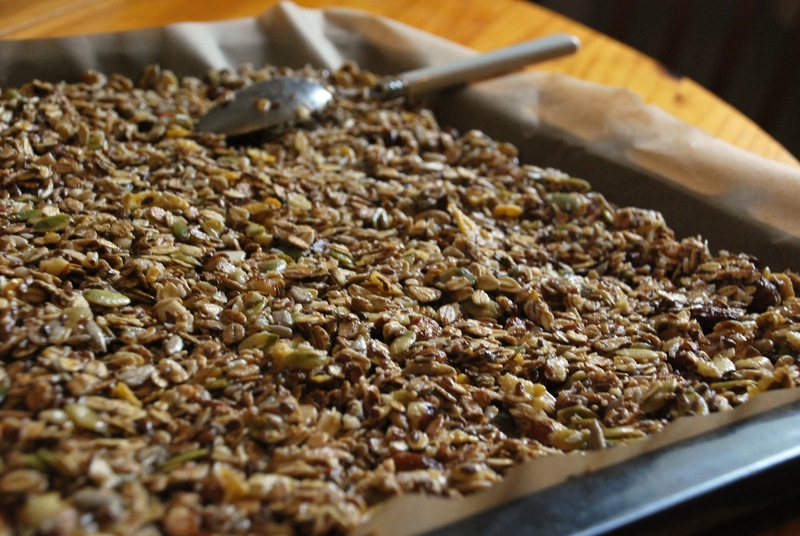 Hi Anne, the recipe from crunchy banana almond granola looks really delicious. I would be interested in how long it can be used – so it does not spoil?